Lately, I’ve been wondering: What is the ultimate soil and plant system to accelerate photosynthesis? Is the system certified organic? Is it no-till? Is it strip-till or minimal till? What about organic no-till? Are animals and their excrement a requirement to maximize the system? I do not have an answer about which system is the best and I envision each of the systems mentioned above as falling along a continuum of good, better, best. Whether you are an organic, transitioning or conventional farmer, there are some principles that can help your system to be better at optimizing photosynthesis and the soil/plant relationship to maximize yield and quality. The less soil disturbance, the better. 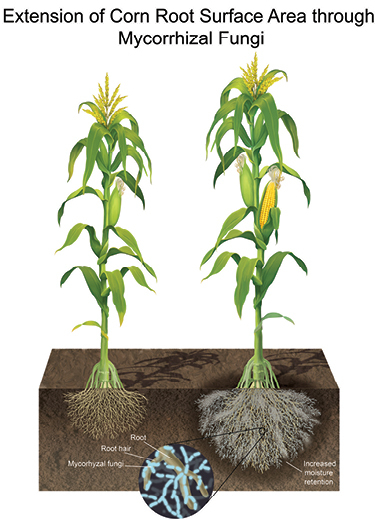 Mycorrhizal fungi are a key extension of a plant’s root system that help deliver mineral nutrient to the crop. Mycorrhizae grow through a network of hyphae (see picture). Tillage cuts through and destroys the hyphae network, requiring the mycorrhizae to re-establish, meaning more limited nutrient delivery to the crop. When thinking about “better” systems, no-till farmers and organic farmers are some of my favorites to have these conversations. However, I’ve sensed that these groups hesitate to talk to each other due to the differences in farming practices – mainly the use of tillage versus herbicides for weed control. I would argue that I see benefit in both groups, and that we are going to need lessons from both to come up with the most innovative and creative solutions for agriculture moving forward. Additionally, such solutions will be for the primary purpose of the farmer to make more money, while also having positive side effects on soil biology, water quality, and human and animal health. As I attend the National No-Tillage Conference in Louisville, Kentucky on January 9 - 12, I am excited to learn from the no-till presenters and audience. I will be looking for ways on how everyone can learn and grow from each other, and I hope to share highlights in future posts. If you have questions or comments, please contact me at ​ dani_kusner@andersonsinc.com or 419-891-2785. Photo courtesy of SARE cover crop image library​. For more information about The Andersons' Organic Program, visit AndersonsOrganics.com or fill out the form below and someone from our Organics team will contact you.